I recently saw “Inside Out” [If you haven’t seen it, GO NOW!]. The film made me realize that we always talk about the economic crisis, but we rarely talk about what we think and feel during the time we stand in line, in las colas. This is the story of how a simple task became a roller-coaster for our thoughts and feelings. “Let’s get some carrots to make carrot cake”. Before I could say anything, Charlie said “that lady has some toilet paper in that bag. It must be from the big Gama Supermarket [Excelsior Gama Plus at La Trinidad]”. We then turned right and headed straight for said supermarket. Locating a possible distribution site of regulated products has become part of our daily train of thought. We are constantly looking at people’s shopping bags and doing the math: “they have Harina PAN, but I have enough at home”, “Is that rice? I need at least two kilos of rice”, “I haven’t seen soap bars in while” and so on and so forth. On the way to the parking lot we noticed some bachaqueros, and a couple of people holding bags with toilet paper. Jackpot! But wait… I suddenly realized it was not our ID day. The feeling: despair. We still had to get the carrots, so we drove past some [lucky] pedestrians with bags of toilet paper to find the entrance to the parking lot. Out of nowhere, Charlie had a Eureka moment and said: “Wait a second… Didn’t Osorio eliminate the ID number restriction?” I wasn’t sure about that, but an awesome feeling emerged: hope. Before we went into the supermarket, we asked a young guy if there was any ID number restriction. He said “no” and we both couldn’t help but smiled. We got in and there was a short line of 5 or 6 people to get “regulated products”. I said “let’s see what they have”, but Charlie grabbed a cart and said “Anabella, get everything”. We each got 3 packs of 4 toilet paper rolls, 2 packs of 24 medium size baby diapers and 2 packs of 8 sanitary pads. It was like gold, frankincense and myrrh, and it all started with an unexpected star of Bethlehem: a [lucky] pedestrian with a bag of toilet paper. We knew that we didn’t need diapers, but we prefer to give them away to someone who needed them before we let some bachaqueros have them. A second after we got our quota in the cart, we offered the diapers to a couple of friends via WA. One said there were too small for his twins, and the other said “I want them”. Cased closed. But let’s not forget, we needed carrots. I walked 10 steps, got a pre-packed tray of carrots and noticed a couple of ladies holding bags powder laundry detergent. As you can see, our “regulated products” radar is never “off”. Charlie also grabbed 4 small bottles of liquid detergent (2 for each), 2 small bottles of liquid stain remover (1 for each) and a big bottle of dishwashing soap. 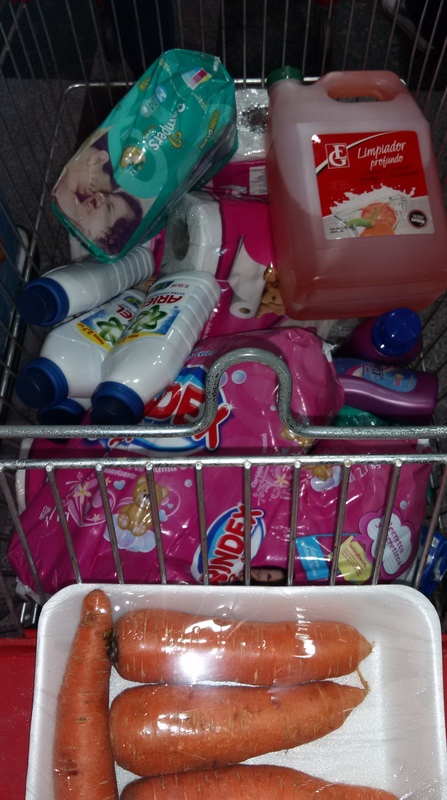 We were marveled by our well stocked shopping cart: 24 rolls of toilet paper, 96 baby diapers, 32 sanitary pads, 5.4 kilos of powder laundry detergent, 2 liters of liquid detergent, 1 liter of liquid stain remover and a big bottle of dishwashing soap. And yes, let’s not forget the carrots. For at least 5 seconds, we felt lucky. We felt un respiro from the everyday craziness. We felt that it wasn’t so bad. But on the sixth second, we came back to reality. We got in line to pay and realized that we were mastering the art of the rationing system. We understood the game and knew how to play. We had made it part of our everyday. Our 5 seconds of luck had turned into revulsion, loathing, despair… and a lot of anger. The cashier asked for our IDs and we each paid for our quotas separately. While we waited for the receipts, he told us that the captahuellas – fingerprint scanners – would eventually get there, but the system was already integrated. So, apparently, once I got my weekly quota in any supermarket, I could not get it anywhere else; or at least not in formal supermarkets, because I imagine that bachaqueros are not exactly “integrated” in this rationing system. Our joint grand total was: BsF 1.985,32. That is only US$ 3.3 at a black-market rate of 611.25 BsF/US$. But our salaries are in bolívares. So we really spent a little over a quarter of a minimum wage. And it all started with a simple task: “Let’s get some carrots to make carrot cake”.